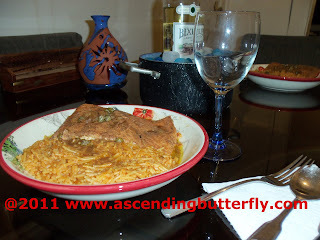 Ascending Butterfly: Ascending Butterfly puts GreenPan to the Test + Tipsy Salmon Recipe! 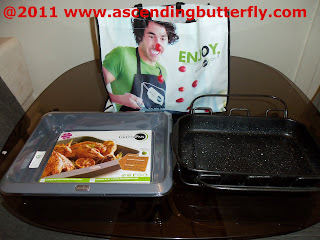 Ascending Butterfly puts GreenPan to the Test + Tipsy Salmon Recipe! Have you ever seen the TV show 'Pimp My Ride'? Well the fine folks at GreenPan, 'pimped my roaster'. And I couldn't be happier! I absolutely love to cook, I'm an adventurous cook and love trying out new recipes. (And adapting them drastically thereby making them 'my own'). My all time favorite roaster to use was my Grandmother's Roaster. I loved using it because it felt like a part of her was still with me. Even though I can't cook for her, using her roaster made me feel like I was still cooking with her. (Her Roaster is the one on the right). Unfortunately the roaster had seen better days and I knew it was time to let it go. I'm pretty hard on my roasters and use them often. I started doing research on replacements and will admit I had been procrastinating a bit because I really didn't want to get rid of my favorite roaster! As you can see from the photo my old roaster really needed to go! I reached out to GreenPan as I had heard really good things about their cookware. I knew going in that non-stick was super important to me, and I wanted something really durable! I was sent the GreenPan Dubai Ovenware Roasting Tin, and right from the begining I will tell you they blew me away with the presentation, in that gift bag (pictured in the top photo), was the Roasting Tin, a frying pan, silicone trivet, an oven mitt, and a cleaning sponge! I really loved the presentation and decided to put my new Roaster to the test right away with one of my favorite recipes! Ƹ̵̡Ӝ̵̨̄Ʒ - Salmon Fillets - (my cooking time is based on Two 1 pound Fillets, adjust based on the amount and pound weight you desire) - You can also use Salmon Steaks if you prefer that cut to the Fillet. Ƹ̵̡Ӝ̵̨̄Ʒ - Rub the salmon fillets with Dry Rub, then marinate them in the lemon juice, White Wine and melted butter (remember if you prefer a non-tipsy version then feel free to omit the wine). Ƹ̵̡Ӝ̵̨̄Ʒ - Arrange in GreenPan Dubai Ovenware Roasting Tin and bake in preheated hot oven (425°F) for about 20 minutes, basting with a combination of melted butter, White Wine and lemon juice every 5 minutes. You do not have to turn (but I prefer to turn them at the 10 minute mark). Ƹ̵̡Ӝ̵̨̄Ʒ - Mix the pan juices with the chopped parsley, basil, dill and capers, and pour over the fillets. Serve the remaining White Wine with dinner and VOILA! BON APPETIT! The first thing I can tell you I loved the most about the Roasting Tin, is that it actually shaved time from this recipe, I use very thick Fillets and it used to take me almost 10 minutes longer to bake in my old Roaster! Total PERK! As I'm the dishwasher (because I don't own a dishwasher), what I was wondering most about was clean up. And much to my surprise clean up was a total breeze, no more letting it soak for awhile and then coming back and using a scouring pad to clean up the roaster. It came clean super easy! Will it last as long as Grandma's Roaster? Who knows. But for now, I'm enjoying faster cook times on all my favorite recipes (including Lasagna, baked chicken and more), and the easy clean up, I'd say GreenPan is a 5 out of 5 butterfly rating in my book! FTC Disclosure: This is a NON-Compensated Post. While the cookware was provided by GreenPan for my evaluation and consideration, all opinions (and recipe) is my own! oh salmon is so good!!! Sounds and looks delish! Hope you enjoyed the salmon. One of my faves. 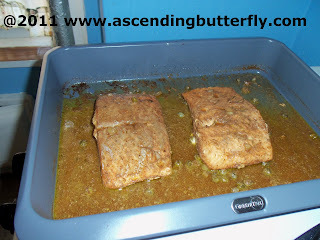 @Zombie - I love Salmon, I have hundreds of ways to prepare it! @Nancy - I definitely did enjoy it!